Mainly sunny. High 77F. Winds light and variable..
Mostly clear skies. Slight chance of a rain shower. Low 53F. Winds SW at 5 to 10 mph. 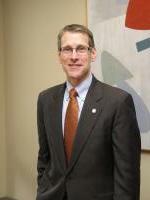 John B. Greving has joined Nebraska Wesleyan University as Vice President for Advancement. His responsibilities include leadership of annual giving, planned and capital giving, grants, stewardship, research, and development support services. He will be responsible for designing and implementing campaigns that will secure support for Nebraska Wesleyan's strategic priorities. Before joining Nebraska Wesleyan, Greving was an independent consultant who provided fundraising services to non-profit organizations. His prior experience includes Head of School at the Nova Classical Academy in St. Paul, Minn., a charter school encompassing grades K-8, and Executive Director of the Sister Kenny Foundation in Minneapolis, Minn., a healthcare foundation. From 1989 to 2001, Greving served as Headmaster of Saint Thomas Academy, a Roman Catholic college preparatory military school for boys. As Headmaster, he led the institution's first capital campaign in many years. From 1996 until 2001, it raised $12.1 million against a goal of $10 million. The overall fundraising program grew under Greving's leadership from $750,000 to $2.6 million per annum. Before going to Saint Thomas Academy, he had more than a dozen years of experience as a teacher, dean of students, and assistant principal in public and parochial schools. Greving earned his B.A. at the University of Notre Dame with a major in sociology. He holds a master's degree in educational administration from North Dakota State University. Nebraska Wesleyan University is a liberal arts institution dedicated to academic excellence in an environment of Christian concern. NWU's Lincoln campus and Omaha site combine small class sizes with a broad-based curriculum of 52 majors and three master's level programs. Nebraska Wesleyan provides students with local, national, and global opportunities that foster their intellectual and personal growth.